Overlooking the ancient and herb-rich landscape of the Appalachian Mountains. From the hills of eastern Kentucky to the Blue Ridge Mountains of North Carolina, there exists an ancient yet vibrant tradition of folk herbalism. The mountains of Appalachia are among the oldest in the world, and their immense botanical diversity hosts an astounding number of useful plants, hundreds of which are found nowhere else on earth.Many of the herbalists scattered throughout this rural part of America learned about the vital magic of plants from their families or community. This knowledge, earned not in classrooms or conferences, but through endless hours spent exploring the abundant ridges and “hollers” of this lushly wooded land, is as unique and integral a part of this region as the native herbs themselves: there are the plants, those who mindfully harvest them, and those who harness their natural goodness for the wellbeing of their families and communities. These roles and rhythms have long sustained humans and herbs alike in a relationship of mutual care and protection. For much of the region’s history, the primary guardian of these herbal folkways has been the land itself, which tends to provide for those who understand it and repel those who do not. The specialized appeal of this beautiful but often harsh landscape has not been widely attractive to land developers, leaving many of the small yet tenacious communities here relatively isolated well into the modern age. The resulting difficulty in accessing institutional healthcare within these remote areas has encouraged residents to turn to the old ways of staying well, drawing on plant allies to promote harmony within the body and the natural world that surrounds them. Additionally, the region’s wildness offers a narrow range of employment opportunities. Rugged terrain limits logging and farming in many areas, leaving coal mining as the primary economic driver. Folks not looking to earn a living underground have learned to harvest the riches growing around them for sale to herbalists near and far. Black cohosh root, Actaea racemose, purchased by small regional root buyer, Lee. In recent decades, however, the heritage herbalism of Appalachia has increasingly come under threat. Both regional supply and national demand for coal have declined, further restricting work opportunities in an already economically challenged region. With few ways to make ends meet, younger residents are moving away from their ancestral homes, leaving few candidates to receive the wisdom of the folk botanists who came before them. Worsening the problem, family lands are often sold to one of the few parties interested in “developing” them: strip mining operations. These last-ditch extraction efforts irreparably destroy swaths of nature’s riches, dramatically reducing valuable plant populations and presenting huge obstacles for traditional wildharvesters. With herb populations decimated by construction, erosion, and water pollution, a harvest quota that has historically been sustainable may suddenly threaten the balance of these ecosystems, forcing collectors to choose between making a living or stepping aside so the plants can make theirs. Either decision contributes to the ultimate decline of Appalachia’s botanical traditions, as both the herbalists or the plants themselves gradually disappear from the region. Just as with plant populations, diversity is key to maintaining a healthy worldwide family of plant lovers, and the dangers Appalachia faces threaten herbalists far beyond those ancient mountains. The keepers and practitioners of this tradition are invaluable to the wider herbal community. Herbalists who specialize in creating botanical preparations in their home apothecaries depend on herbalists in the field for their expertise in finding, properly identifying, and respectfully harvesting these precious local botanicals in ways that protect their ability to propagate and thrive for future generations. Those of us with the luxury of having these herbal delights delivered right to our doorsteps owe our gratitude to the discerning hands that provide them, and we all have a stake in a helping them overcome the challenges they face. 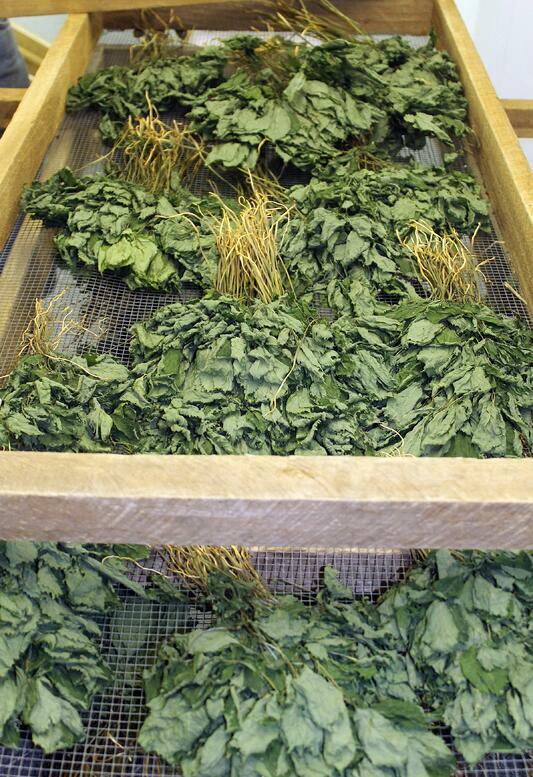 Certified organic, forest-grown American ginseng leaves drying after harvest. While there are no simple solutions, knowledgeable individuals with deep connections to the region have suggested some strategies to move things in the right direction. Lee, a lifelong Appalachia resident, former wildcrafter, and current liaison between regional wildharvesters and reputable herb distributors, believes that proper valuation would be a huge help. As the herbal community gains awareness of just how useful and special these plants are, it allows buyers like him to better compensate those who provide them, reducing the temptation to overharvest. Creating a demand for quality over quantity also benefits both plants and harvesters, as it rewards selectiveness in plant collection and generally favors more mature plants, leaving younger ones to grow and replenish their numbers through reproduction. This is especially beneficial for plants prized for their roots and rhizomes, like slow-maturing organic forest-grown American ginseng (Panax quinquefolius). Another solution to keep both people and plants rooted in the region is to encourage the practice of organically cultivating these valuable herbs, as many thrive under the exact conditions that make other kinds of farming impractical. In United Plant Savers’ 2018 Journal of Plant Medicinal Plant Conservation, another multigenerational Appalachian and wildharvester, Laurie Quesinberry, characterizes cultivation as “the only truly viable path” to allow these plants and her family to endure in the face of ever-encroaching bulldozers and the highways that follow them. Lee agrees, noting that if more folks start growing herbs in certified organic conditions, it will increase consumer demands for this standard of product, supporting a much-needed new regional industry, while discouraging overharvesting on wild, public lands. 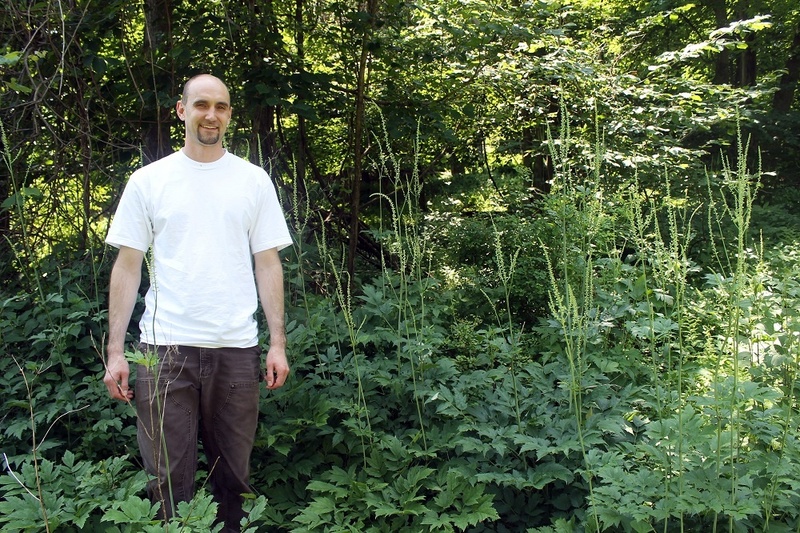 Mountain Rose Herbs farms liaison, Jacob Lauch, explores a wild stand of black cohosh while connecting with our growing partners in western Virginia. 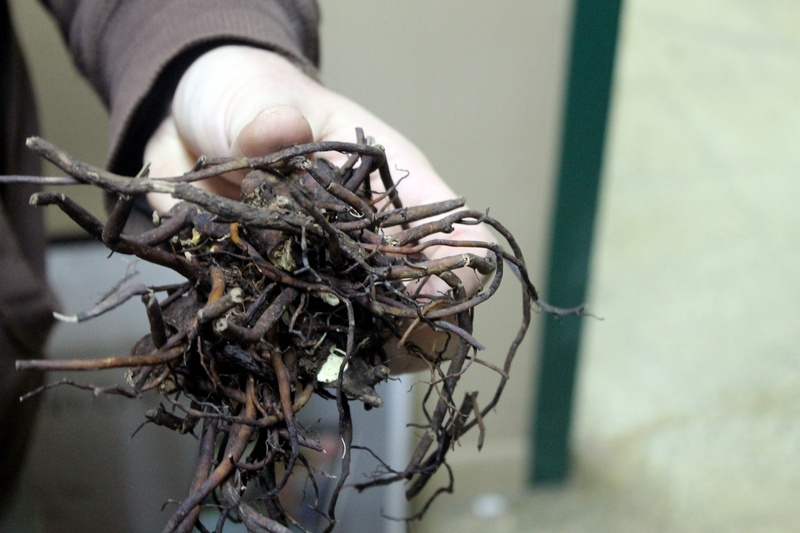 Mountain Rose Herbs is proud to support passionate, responsible, and knowledgeable farm and forage partners in this region by offering a number of mindfully harvested, wild-stewarded Appalachian botanicals, including sassafras bark, gravel root, and Forest Grown Verified black cohosh root. We believe strongly in the value of supply chain visibility. 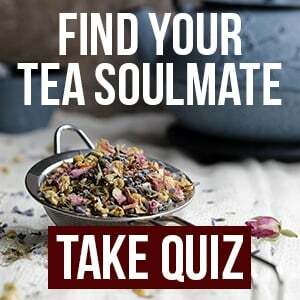 Highly valuable, mindfully gathered herbs do not come from an unknown, fly-by-night business entity on the other end of the phone or email. That’s why we go right to the source when vetting our potential growers, allowing us to meet, get to know, and build lasting relationships. We only work with those who care deeply about their calling to serve their fellow humans by cultivating, harvesting, and handling precious plant material with the care and gratitude the plant kingdom deserves. With their help, and the global herbalism community’s support, we believe that these magical plants can endure and thrive for generations to come. 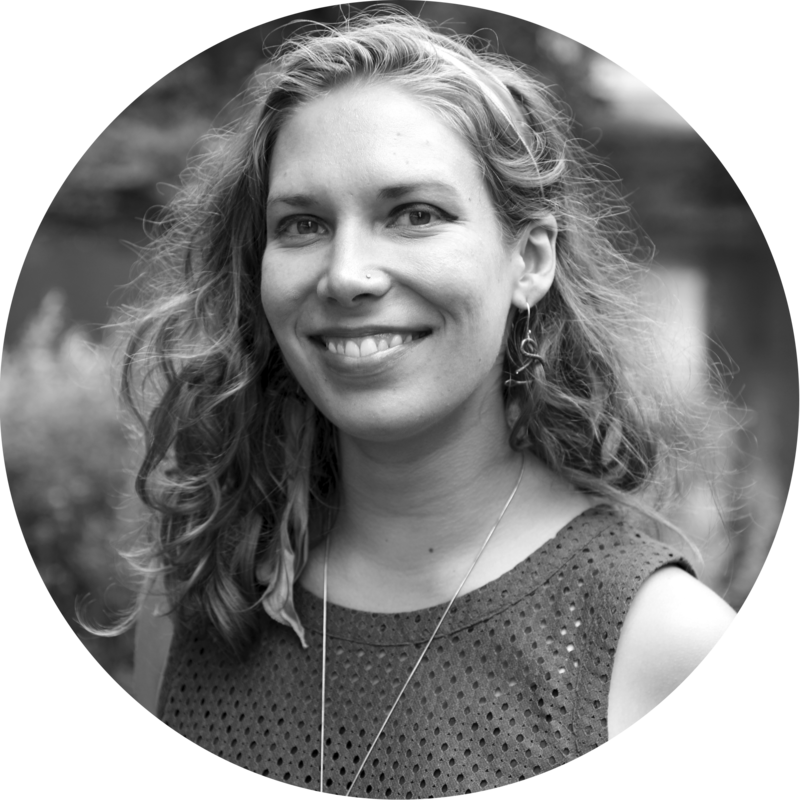 Want More Local Soil Stories? Meet Our Pacific Northwest Farmers!